Senator Al Franken, a Minnesota Democrat, calls on the Senate to pass the USA Freedom Act during a speech Thursday, May 21, 2015. Congress is facing an effective deadline of this weekend to extend the phone records collection section of the antiterrorism law, with Section 215 of the Patriot Act expiring June 1 and lawmakers scheduled to take a weeklong break after finishing business this week. On Thursday, Senators were wrestling with three alternatives: allow the Patriot Act's records collection program to expire, extend the program with no new limits, or pass a House of Representatives bill that aims to end bulk records collection but allows the NSA to search phone and business records in a more targeted manner. Senate Majority Leader Mitch McConnell, a Kentucky Republican, said late Thursday he will push for a vote by the weekend to extend the Patriot Act's records collection provisions. The White House, leaders in the House of Representatives and some senators called on Senate leaders to schedule a vote on the House-passed USA Freedom Act, a bill that would prohibit the NSA from collecting domestic telephone records in bulk. The bill would allow the agency to operate a more targeted records collection program. But McConnell reportedly continued to push for a vote to reauthorize the current NSA phone records collection program with new no limits on its scope. Early Thursday, McConnell announced his intention to schedule votes to close debate on both the USA Freedom Act and a second bill to extend the current records collection program under the Patriot Act for two months, until July 31. Other lawmakers and some digital rights groups have called on Congress to simply let Section 215 die. The USA Freedom Act would allow the NSA to collect some phone and business records without court-ordered warrants, a violation of the Fourth Amendment of the U.S. Constitution, Senator Rand Paul said during a 10-and-a-half hour filibuster Wednesday designed to stall a vote on extending Section 215. Paul, who like McConnell is a Kentucky Republican, said Thursday he will push for a number of amendments to legislation to extend Section 215 of the Patriot Act, including amendments that would go beyond the limits on the NSA program in the USA Freedom Act. Paul advocates several changes that were rejected in the House debate on the USA Freedom Act, including a prohibition on the FBI searching U.S. residents' email and other communications without a warrant. The FBI is now allowed to search U.S. communications swept up in a separate NSA program targeting overseas terrorism suspects. Paul also wants to prohibit U.S. agencies from making technology companies build security back doors into their products. Another amendment he seeks would prohibit law enforcement agencies from using information collected by the NSA to bring criminal complaints unrelated to terrorism. The U.S. Drug Enforcement Administration has used NSA databases to bring drug charges against U.S. residents, he said. If the Senate fails to act before Congress's weeklong recess, the NSA's phone records program would shut down just before midnight on Sunday, May 31, according to the U.S. Department of Justice. The Senate needs to pass the USA Freedom Act to allow the NSA to continue its antiterrorism work, White House spokesman Josh Earnest said during a press briefing Thursday. "It would be irresponsible to let these authorities to lapse even for a few days," he said. Senator Al Franken, a Minnesota Democrat, also called on the Senate to pass the USA Freedom Act, saying it contains several provisions to make government surveillance requests at U.S. Foreign Intelligence Surveillance Court more transparent. 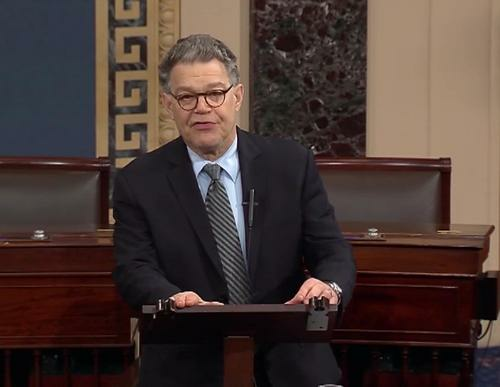 "Some of my colleagues are attempting to present us with a choice between reauthorization of the soon-to-expire authorities, with no reforms whatsoever, or complete expiration of those authorities," Franken said on the Senate floor. "That is profoundly unfortunate, because we have a compromise bill that has been overwhelmingly approved by the House of Representatives."